Taylor Krause just spent the weekend in Happy Valley where she helped the Parkland High girls volleyball team win the title in the State College Invitational. Hopefully, Krause felt at home because beginning in 2013, State College will be her home. 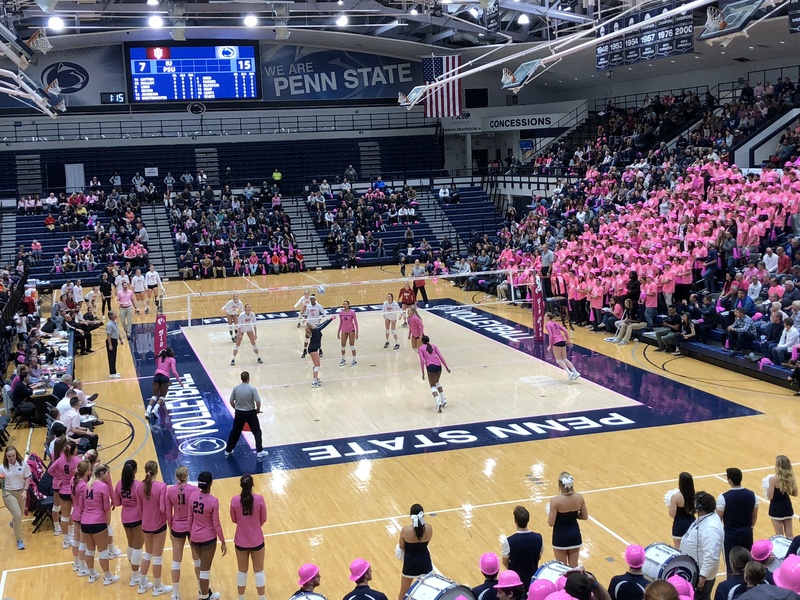 That’s because Krause, just a high school junior, has already verbally committed to be a walk-on at Penn State, which happens to be the most successful volleyball program in the country and one of the nation’s best collegiate programs, period. John Heilig, in a Special to The Morning Call, has a writeup on Parkland High School’s loss to Hempfield on November 17, 2012. Penn State 2013 verbal commits 5-6 DS Taylor Krause and 6-0 MH/OH Kelly Robertson were among the key players for Parkland. The Parkland girls volleyball team has cryptic messages on the backs of their practice T-shirts. This year, the message was CTHOMT — for Climb The Hill One More Time. It has a double meaning. As a training exercise, the girls race up a hill on the Parkland campus, and they wanted to climb the hill to a state championship one more time, as they did last year. Unfortunately, Hempfield, the team the Trojans defeated in the championship match last year, had other ideas. The Black Knights defeated the Trojans, 3-1 to regain the championship they won in 2010 and lost last year. Read John Heilig’s article at The Morning Call.com. Krause’s Parkland team won the 2011 Pennsylvania Class 3A State Volleyball Championship. Taylor directed the 5-1 offense and remains undefeated in best of 5 match play in her setting career. She was named to the PVCA All Tournament Team. For more on the tournament, Click Here for a November 15, 2011 article by John Heilig from The Morning Call. Update: Taylor was one of 36 juniors to be recognized by Prep Volleyball as an All-American and was a finalist for the Pennsylvania Gatorade Player of the Year award. She was named to the District XI and PIAA State Championships All Tournament teams and to the Pennasylvania Volleyball Coaches All State team. Taylor led Pennasylvania in assists per set and finished 9th nationally. According to Ciniglio, Muller also had offers from Rutgers, Michigan, Bucknell, Miami and Ohio State. We came across this video of Mira Costa High School’s 3-1 win over Palos Verdes Peninsula. 2013 Penn State verbal commit 5-9 Carley Muller is the starting libero for Mira Costa. The match was played on October 9, 2012. Carley Muller is #4 for Mira Costa. Kelly Robertson, a 6’0″ Junior MH/OH from Parkland High School in Pennsylvania, verbally in mid-February 2012 to join Penn State for the class of 2013. As noted on the Synergy Volleyball Club website, Kelly has earned numerous honors, including MVP awards for her league, and the District and PIAA AAA state championship tournaments. Kelly also was selected to the Pennsylvania Volleyball Coaches All State team, was also a finalist for the 2011 Pennsylvania Gatorade Player of the Year, and, as reported by the Synergy Volleyball Club, was named by PrepVolleyball.com as an All American and finalist for National Junior of the Year (as was her Parkland High School teammate (and cousin) and fellow 2013 Penn State verbal commit, Taylor Krause). Kelly has been the offensive mainstay for both high school and Synergy Lehigh teams. Kelly is a very deserving, humble, hard working young lady. She is a teammate who values team success ahead of individual accomplishment.